Michael Currid shows in Calvin and the Biblical Languages how the return to the originals languages helped spawn the Reformation. It was a recovery of the raw Word, not just a priest or pope’s interpretation of it. No longer was the Word chained to the pulpit, but farmers and mothers and gardeners were encouraged to understand it for themselves. We have Beza, Calvin, Luther, and Knox to thank for the emphasis on studying and teaching Scripture in the original languages. With skill, Currid summarized Calvin’s monumental preaching schedule and the role in which Greek and Hebrew played. But as St. Luke likes to say, the points over which to quibble are “not a few”. So lets get started. The first cavil reminds me of the time a seminary professor confessed why he hated to read biographies: the authors presents their subject as nearly perfect—and who can emulate that? In quoting Colladon, the author gets a bit too close to hagiography. “When lecturing, [Calvin] always had only the bare text of Scripture; and yet, see how well he ordered what he said! And it was not as if he had adequate time to prepare; for, whatever he may have wished, he simply had not the opportunity. To say the truth, he usually had less than an hour to prepare” (46-47). Calvin preach magisterial sermons with virtually no time for preparation. And he didn’t sleep. And he worked 25 hours a day. On the one hand, we are called to labor doggedly over the original languages, but on the other we to admire the Reformer who did his sermon prep on his carriage ride to church. So which is it? 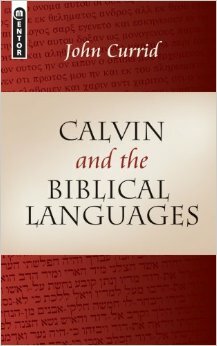 A second concern is whether or not a thorough understanding of Greek and Hebrew is as necessary today as it was in Calvin’s era. He learned Greek and Hebrew in his twenties, no doubt laying a foundation for a lifetime of solid exegetical study. But times have changed. The number of Hebrew and Greek tools today are overwhelming. Scores of guides, programs, charts, lexicons, and dictionaries hit the press each year to help pastors understand the biblical languages. But they are not designed to help him understand only. These tools are there to make Bible study more efficient so that time can be spent elsewhere. Maybe Currid is correct that in Calvin’s day “a student without the working knowledge of [Latin, Hebrew, and Greek] would have been academically lost” (49).Yes, it may help our preaching knowing that “to bear one another’s burdens” in Galatians 6:2 is bastazete, and that it is an imperative verb. Calvin had that declension memorized and could locate it on the spot. But are we really prepared to argue that preachers today who cannot do this are lost? And what about the millions of pastors today in rural regions who do not know the languages as such? Or not at all? As Frame argues, there are scores of commands to carry out in Scripture, and as finite beings we must prioritize the most important duties in our ministry. Knowing Greek and Hebrew like Calvin is no doubt important for some, but let us not over speak by implying that all pastors should have a thorough grasp of the Biblical languages. Many rural pastors or missionaries or even suburban shepherds who decided to hunker down in their homes to memorize Greek paradigms may be avoiding a litany of other duties, and this would be wrong. This entry was posted in Book Reviews and tagged Calvinism, Greek, Hebrew by Paul Schlehlein. Bookmark the permalink.